This year, three schools in Skopje with together 1500 pupils took part in the ZOOM-campaign- welcome! The children of the school OOU Petar Pop Arsov founded an eco-club. In this club, they talk together about issues like recycling or food. The club publishes a school magazine, called Eko Svet (Eco World) and performed a play in front of the whole school. The ZOOM activity week took place from 26 October to 2 November. The 320 children collected their Green Footprints just before the deadline as the package with the material arrived so late in Macedonia. Here is their report (pdf, 2,6 MB). The activity week was realize from 29. 10 .2012 – 05.11.2012. During the activity week we collect 2894 green footprints. "ZOOM" on the moving to learn how to keep air clean. - Making flags with footprint, every pupils involve in this activity makes it’s own flag. The flags we use to show on the community that waking to school is IN and coming with cars is OUT. Everybody enjoyed the activity week and we already have plans how to participate next year. Our municipality “Karpos” is very proud what we do and for the next year they are planning to support this activity in every school and kinder garden in our municipalities. With hope that next year we will carry out a much better activity week. Furthermore they sent us great photos of their "recycling art". The Vlado Tatsevski School, the third Macedonian participant, sent us many photos and a comprehensive report (pdf, MB. 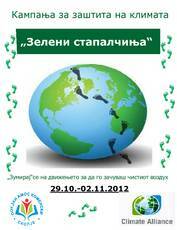 320 children collected 3986 Green Footprints in one week. Making flags with footprint: all pupils were involved in this activity. IN and coming with cars is OUT.